Situated in Rangely, this hotel is 0.4 mi (0.6 km) from Rangely Town Hall and within 3 mi (5 km) of Rangely Museum and Cedar Ridges Golf Course. Dinosaur National Monument and Colorado Welcome Center are also within 20 mi (32 km). Situated in Rangely, this lodge is within a 15-minute walk of Rangely Museum and Rangely Town Hall. Cedar Ridges Golf Course is 1.7 mi (2.7 km) away. Situated in Meeker, this hotel is within a 5-minute walk of Town Park, Meeker Chamber of Commerce, and White River Valley Museum. ERBM Recreation & Park and Meeker Golf Course are also within 1 mi (2 km). 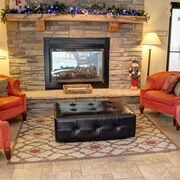 Situated in Meeker, this hotel is within a 5-minute walk of White River Valley Museum and Meeker Chamber of Commerce. Town Park and Sixth Street Park are also within 15 minutes. How Much is a Hotel Room in Rangely? Hotels in Rangely start at $75 per night. Prices and availability subject to change. Additional terms may apply. 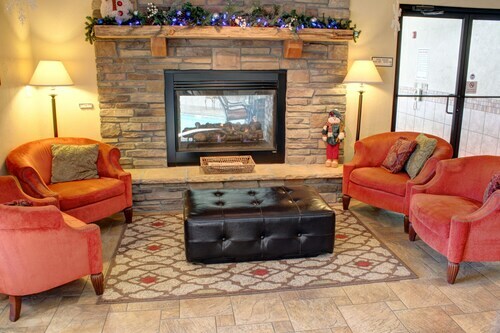 Although there are no Travelocity-featured Rangely accommodations options close by, we offer 2 places to rest that are within 20-30 minutes by car from Rangely. The Budget Host Rangely, Colorado, which is the nearest Travelocity-listed accommodation, sits 9 miles (14 kilometers) from the city center of Rangely. However, you might like to try the Blue Mountain Inn And Suites, located in Colorado, which is 9 miles (14 kilometers) from the heart of the city. Anybody that is wanting to discover more of the mountains and snowfields common in this part of the country, you might also put aside a few extra nights in other destinations in Western Slope. Enlightened travelers should photograph the area's various sights or have a go at snowboarding and then reserve a close Travelocity-registered hotel to stay at. The nearest hotels in Western Slope include Grand Junction and Grand Junction. Grand Junction is 60 miles (96 kilometers) to the south of Rangely, while Grand Junction is 60 miles (96 kilometers) to the south. Travelocity-listed hotels in Grand Junction are the Holiday Inn Express & Suites Grand Junction and Doubletree Hotel Grand Junction. The La Quinta Inn & Suites Grand Junction and Holiday Inn and Suites Grand Junction are a number of the hotel establishments in Grand Junction. When you're flying through Vernal Regional Airport and are hoping to find accommodation nearby, consider TownePlace Suites by Marriott Vernal or SpringHill Suites by Marriott Vernal. It was incredibly clean and wonderfully equipped. The bed was really comfortable and I slept like the dead. The breakfast buffet was full of options, I had bacon, scrambled eggs and pancakes plus fresh water and coffee. It was all wonderful. I did not have a single complaint and normally I am really picky.